[Ilse Koch was accused of taking souvenirs from the skin of murdered inmates at Buchenwald with distinctive tattoos, but all the evidence points to her being a victim of the Human skin lampshades PSYOP. 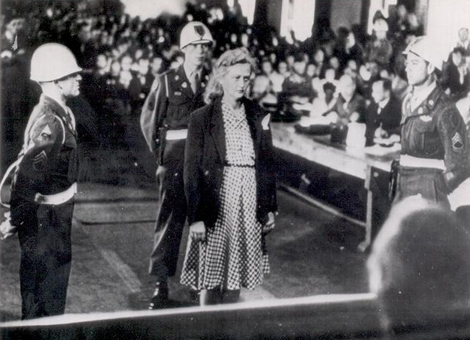 She was the wife of Karl Koch, the commandant of the concentration camps Buchenwald from 1937 to 1941 and Majdanek from 1941 to 1943 who was executed by the SS for corruption and murder under Judge Konrad Morgen, which hardly suggests she would get away with that! On the display table is a 50-page dissertation on the subject of how criminality relates to tattoos. It was written by a German camp doctor on the Buchenwald camp premises, around 1939-40, which may explain where those tattoos came from. "But he (Konrad Morgen) refused to give perjured testimony at Nuremberg to the effect that Ilse Koch, widow of the commandant hanged by the S.S., had made lampshades out of human skin. 'That was a legend,' he said: 'totally untrue. The Americans almost killed me,’ recalled Morgen. ‘They threatened three times to turn me over to the Russians or French or Poles.'" Of all the table items above, I believe that David Hackett has the only remaining object. 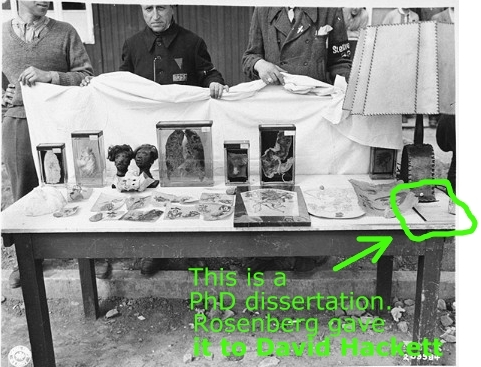 He has the dissertation, because Albert G. Rosenberg gave it to him. In a phone conversation, and before I told him I was a denier (he won't respond to me now) Professor David A. Hackett, the translator of "The Buchenwald Report" told me that among all the papers that Rosenberg gave him around 40 to 50 years after the war, was this dissertation, written by a German doctor who was studying a perceived connection between criminality and tattoos. (Common criminals were a significant part of the inmate population at Buchenwald.) Hackett told me that he'd read the dissertation and it was of really poor-quality scholarship. But consider that the dissertation is a piece of withheld evidence. Ilse Koch's lawyers would have liked to have known about it. After all, it could have helped exonerate Koch from the incredibly cruel charges that she made lampshades out of human skin. Her lawyers could have offered an alternate explanation, using the dissertation to bolster the notion that tattooed skin was at the camp because a student had been studying the skin. Similarly, the Nuremberg defendants' lawyers would have also wanted to see it, since they could have used it to offer an explanation as to why tattooed skin was found at Buchenwald. The Germans' lawyers probably never knew the dissertation existed. During various trials, Rosenberg had this evidence and withheld it. Does the dissertation mention anything about tribalism? Hackett won't answer my emails. The dissertation is the only thing on the table that is known to be in existence today. Rosenberg gave it to Hackett in the 1980's or 1990's and Hackett currently possesses it. In my nearly two-hour phone conversation with Rosenberg, he told me that he "burned half of the reports" he had lying around from his days in Psych Warfare. Did he also get rid of things like the "human pelvis ashtray"? One wonders. Imagine this withheld piece of evidence, in trials where people were sentenced to death long ago in Germany, probably sitting in the bottom of some box in some garage in El Paso, Texas; as kids ride their Razor scooters by on the hot asphalt street out in front. Professor David A. Hackett, who is not a holocaust denier, documents this in the introduction of his book, page 5. The book is a translation of the 1945 "The Buchenwald Report." Hackett inadvertently reveals that nearly everyone in psyche warfare involved regarding Buchenwald was Jewish. You can tell from their names: Edward A. Tenenbaum, Albert G. Rosenberg, Daniel Lerner, Saul Padover. Rosenberg was German Jewish. Tenenbaum was American Jewish. Jews were probably around 2 percent of the US population at the time. Tenenbaum was the first American to arrive at the camp along with a civilian named Egon Fleck. On page 5 of Hackett's book, it mentions that Tenenbaum stayed overnight in block 50. Maps show that that is in the medical experiments area, which would have been the right place to plant skin and shrunken heads. Then again Rosenberg could have planted them when he arrived 5 days later. The Problem with The Psych Warfare Plan: If Psych Warfare had known about Konrad Morgen, they might have done the math. 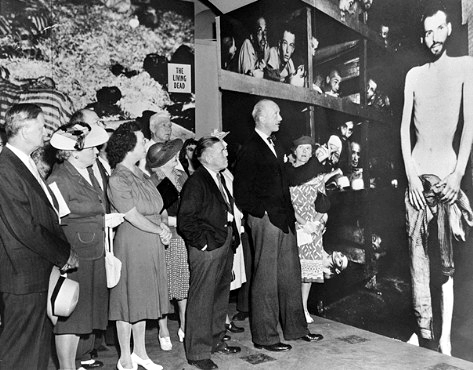 The math is that no one associated with the rumor of the tattooed skin, shrunken heads, and lampshades had been at Buchenwald for almost two years. Morgen had arrested four people: Karl Koch, his wife, the deputy camp commander, and the lead camp doctor, all in late 1943. 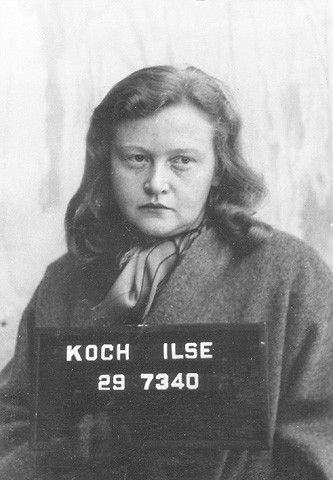 In the subsequent trial the charge against Ilse Koch regarding making items out of skin was withdrawn due to lack of evidence, (20) and Ilse was acquitted on the charge of embezzlement, but her husband was found guilty of murdering 4 inmates. He was sentenced to death and later executed, as was the deputy. 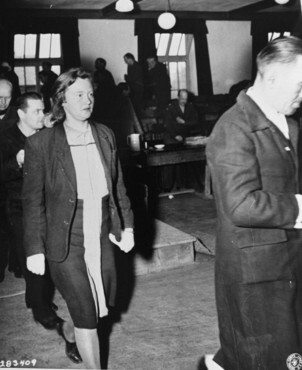 When the Americans arrived, Ilse Koch hadn't lived at Buchenwald for almost 2 years. And during the Morgen crackdown, one would think the camp would have been run by the book. The new commander of Buchenwald, Hermann Pister, was already there in July 1943 when Morgen started his 8 month investigation. Karl Koch had transferred to be the head of Majdanek in 1941. The new commander, Hermann Pister, was never charged by the SS nor later the Americans with making shrunken heads or procurring human skin, so it doesn't make sense that the Americans would find these items when they arrived almost 2 years later. Morgen threw a wrench into the works of the Psych Warfare plan, because they didn't know about him. "She was a very beautiful woman with long red hair, but any prisoner who was caught looking at her could be shot," recalled Kurt Glass, a former inmate who worked as a gardener at the Koch family villa. "She got the idea she would like lamp shades made of human skin, and one day on the Appellplatz we were all ordered to strip to the waist. The ones who had interesting tattoos were brought to her, and she picked out the ones she liked. Those people were killed and their skin was made into lampshades for her. She also used mummified human thumbs as light switches in her house." According to a book entitled "The Order of the Death's Head: The Story of Hitler's SS," by Heinz Höhne, Otto Koch had extorted money from Jewish prisoners who were sent to Buchenwald in November 1938 following the state-sponsored pogrom known as Kristallnacht. Approximately 10,000 Jewish men had been brought to Buchenwald in November 1938 but they were offered the opportunity to be released if they promised to leave Germany with their families within six months. Koch was accused of taking money from these prisoners without official authorization. Koch had also ordered the deaths of two prisoners, allegedly in an attempt to cover up his misdeeds. Before his crimes at Buchenwald were uncovered, Commandant Karl Otto Koch had been transferred to the Majdanek death camp in Poland in September 1941, but his wife stayed behind, continuing to live in the Commandant's house. According to the Buchenwald Report, it was rumored that Ilse Koch was having simultaneous love affairs with Dr. Waldemar Hoven, a Waffen-SS Captain who was the chief medical doctor at Buchenwald, and Hermann Florstedt, the Deputy Commandant. Both Florstedt and Dr. Hoven were put on trial in the special Nazi court, which was run by Dr. Georg Konrad Morgen, also an officer in the Waffen-SS. 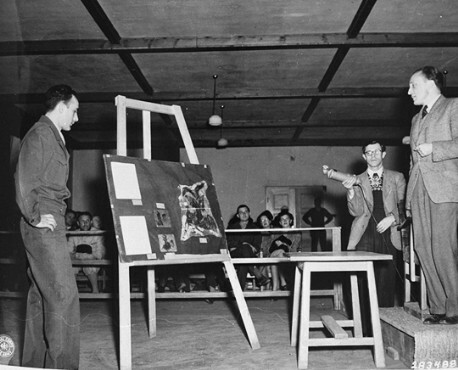 Florstedt was convicted by the Nazi court and was executed. Dr. Hoven, who was a Communist sympathizer, was convicted of killing non-Communist Buchenwald prisoners by injecting them in the heart. He was sentenced to death by the SS court, but his sentence was never carried out. After serving 18 months in the Buchenwald camp prison, he was reprieved because there was a shortage of doctors in the camp and his services were needed.